The kids and grandkids are heading back to school, hunting season is just around the corner and that means it’s almost time for the annual Ahlmans Shooter’s Roundup in Morristown, MN! If you’ve never been to Ahlmans Roundup, you won’t believe how much fun it is! You can peruse through the gun manufacturers’ booths and look at their new demo guns – hundreds of them throughout the grounds! You can check out the life-sized Fort Ahlman’s or the real-life old western town storefront. You can visit Machine-Gun Jerry’s live machine gun shoot and pay to shoot a variety of the coolest full-auto weapons you’ve ever seen! You’ll see tons of gun fire at more than 50 live-fire shooting ranges. There’s food, camping, gun-giveaways, 8 entertainment stages, 2 live bands and tons of exhibitors displaying everything imaginable – not to mention Ahlman’s gun shop with over 5,000 guns for sale! 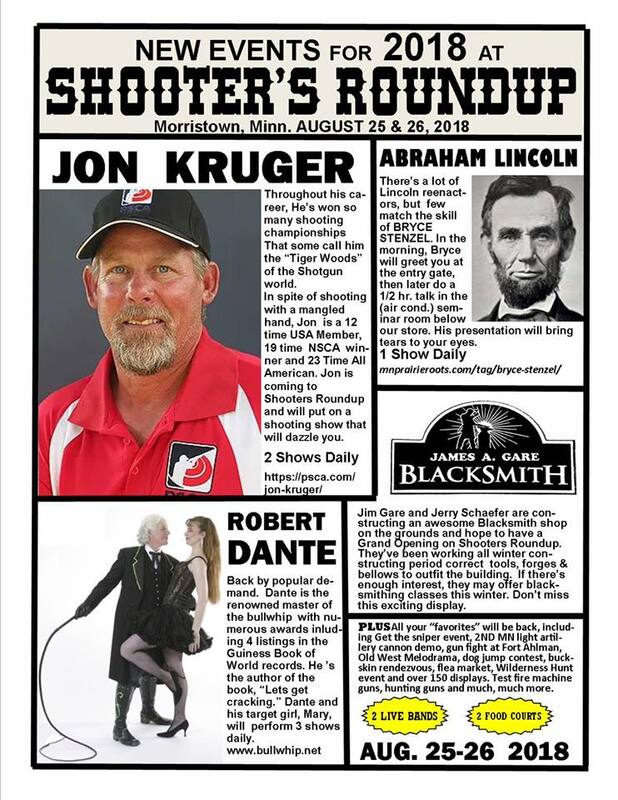 See the picture below for NEW events at this year’s Shooters Roundup! Of course, Minnesota Gun Rights will be there all day Saturday getting petitions signed OPPOSING radical gun-control for Minnesota, so stop by and add your name! We’ll also be selling MGR memberships with an “Ahlmans special” of a FREE T-shirt and bumper decal with any new or renewed membership. If you’ve never been to Ahlmans Shooter’s Roundup, you don’t know what you’re missing. Again, it’s all day Saturday, August 25 and Sunday, August 26 at the Ahlmans Shooting Complex located at 9525 230th St W in Morristown, and the entrance fee is only $10. It only happens once a year so mark your calendars. It’s going to be a very exciting event and we hope to see you there! P.S. The annual Ahlmans Shooter’s Roundup is just around the corner! Save the date: it’s NEXT Saturday, August 25-26 at Ahlmans Gun Store, located at 9525 230th St W, Morristown MN. This is THE signature non-competition shooting event within 500 miles and you won’t want to miss it, that I can tell you! So save the date and when you’re done, be sure to share this message with all of your friends so they can sign up as well!